I recently made a very good Thai Style Beef and Vegetable Stir Fry from this recipe on Well Nourished. The original recipe is vegetarian, but the author discusses adding meat to it. The sauce is really quite good, but I did find it a tad garlicky. next time, I'd ramp down the garlic. The great thing is that even though you have to take the time to make the sauce, it makes enough for two stir fries. This means that you can put the leftovers into the freezer for another day - fabulous! I like recipes where the hard work pays off like that. If you like stir fry and you enjoy Asian flavours, this healthy recipe is worth trying out. A few weeks ago, my family went to Abbey of the Roses in Warwick for morning tea and a tour. The Abbey of the Roses was a former Sisters of Mercy nunnery, and was built in 1891. It was in the hands of the nuns until the late 1980s, when it was sold, and has gone through several iteration in that time. Its current owners bought the Abbey and restored it to its former glory as far as possible, although previous owners had irreversibly destroyed certain aspects of the interior. The Abbey is huge, so its owners run it as accommodation, a wedding venue and conduct tours to help pay for its upkeep. If you happen to be on the Darling Downs in your travels, it is worth making a visit to the Abbey of the Roses - but do remember to book (you can't walk in). For our Movember morning tea last week, I also made Beef and Bean Sausage Rolls from the Bourke St Bakery Cookbook. These sausage rolls are inspired by chili con carne. I was glad I made these, as they were the sole savoury offering on our morning tea menu, and they went quickly. If I say so myself, they were delicious. It also used up the puff pastry living in my freezer, taking up precious space. Heat the oil in a pan and add the onions, chillies and garlic and cook for 2 minutes. Add the kidney beans stir together for 1 minute. Remove from the heat and allow to cool. Put the bean mixture in a large mixing bowl and add the beef, breadcrumbs, salt and pepper. Using your hands, mix for 3 minutes to thoroughly combine. Make an egg wash by whisking together the egg, milk and a pinch of salt. Take a pastry sheet and cut it in half so that you have two long rectangles. Divide the beef mixture into six even-sized portions. On a clean work surface, roll each portion out into a log. Place each log in the centre of a pastry sheet and brush one long edge with egg wash. Firmly fold the pastry over, pressing to enclose, leaving the ends open. Cut each roll into 3-4 pieces and place on baking trays lined with baking paper. Brush the top of each roll with egg wash and sprinkle with chilli flakes. Bake for 35-40 mins, or until they are golden brown. This week's Eating with Ellie theme is Fowl Weather, chosen by Kayte. You might not be able to see it, but there is chicken in the dish that I chose, being the Asian Noodle Bowl. This is a terrific dish, because it is full of vibrant, fresh vegetables to go with the soba noodles (I used wholemeal spaghetti, being the alternative) and chicken. The second Tuesdays with Dorie recipe from Baking Chez Moi this month is Apple Speculoos Crumble. This is apple crumble with a twist - namely, that the crumble is made from crumbled speculoos biscuits and butter. I used gingernut biscuits instead of speculoos, as I already had them in the house. I also used the optional nuts with the apple, in my case, almonds. I made two ramekin sized serves instead of one big one. This dessert was OK, but I think I like traditional apple crumble better. This month is Movember. During Movember, guys grow 'taches for money to raise funds for the Movember Foundation to address some of the biggest health issues faced by men: prostate cancer, testicular cancer, and mental health and suicide prevention. My work has a fundraising team, and I decided to help out by organising a Movember morning tea, entry by gold coin donation. It was a little fiddly, but I think they look great. We raised $62.40 for our Movember team, which is a good outcome as we only have a small office and a lot of people were away on the day. For Eating with Ellie this week, the theme is Chili Today, Hot Tamale, chosen by Peggy. I made Ellie's White Turkey Chili. This dish is meant to be all white - however, it is too hard to get white corn here, so I just used the regular kind. I thought this was quite tasty - not much else to say about it because it is what it says on the tin. Chili is welcome in these parts at the moment, because while it might officially be mid-spring, the weather is stuck firmly in July. For my second Dorie's Cookies recipe, I have made the Chocolate Sandwich Cookies. if you thought that these looked like Oreos, you are right - Oreos were the inspiration for Dorie's recipe. I personally think these cookies are much nicer than Oreos. They are not as sweet - in fact, they were not high on the sweetness factor at all, just delightfully chocolatey. The filling was lovely too - half a tablespoon in each cookie is all that you need, and I found that even when I ate a cookie before chilling that the filling was thick enough not to squeeze out. I made a half batch, which still seemed to make a lot of cookies! I am giving my cookies to the receptionist at my Pilates clinic to celebrate her finishing her music degree. I have a small embossed roller featuring music notes that I bought at The Cake Bake and Sweets Show this year, so I ran it over the cookie dough before baking so that my cookies are personalised for the recipient. I found that the embossing worked best when I pressed a little more firmly (the first batch are not as distinct with the embossing). To see what everyone else made for Tuesdays with Dorie this week, visit the LYL section of the TWD website. Service is done the old fashioned way - you are referred to as "sir" or "madam", as the case may be, and you are waited on very attentively. There is a stool for your handbag, and crumbs are vacuumed off the white linen tablecloth between courses with what looks like a gold cigarette case. At Tim's option, we went a la carte - 3 courses for $140. Again, it was such a pretty dish. The kale is the green swishes on the plate. The little splodges on top of the fish are nduja, a spreadable salami. This dish was very light and enjoyable - I was happy with my choice, and a light meal helps you to manage three courses. What a terrific dinner! We loved our Grossi Florentino experience. On Thursday night, seven members of The Melbourne Cake Club met at Lady Grange in St Kilda to celebrate Springtime and eat cake. My cake was a Strawberry Cream Cake decorated with a flower and spring-coloured decorations. Preheat your oven to 180 degrees Celsius. Grease and line 3 x 9" cake tins. Cream the butter and sugar in a stand mixer. Add the eggs, one at a time, and beat until combined. Add the melon juice and vanilla and beat well. In a medium bowl, combine the flour, jelly crystals, baking soda and salt. Add the flour mix and buttermilk to the cake batter alternately, starting and ending with flour, and beat on low speed until combined. Fold in the strawberries by hand with a rubber spatula. Divide the batter evenly between the three cake tins and bake for 35-45 minutes or until cooked through. Allow the cakes to cool in their tins for 10 minutes before unmoulding and immediately wrapping in cling film, and refrigerate until chilled. Hull the strawberries and blend to a puree in a food processor. Put the puree in a small saucepan and simmer over medium heat until reduced by half. Cream the butter in a stand mixer, then add the icing sugar, 1 cup at a time, until well combined. Add the jelly crystals, vanilla and salt and beat well. Add the cooled strawberry reduction and beat until combined. Decorate the cakes as you want to! White Chocolate Cake with Rose Flavoured White Chocolate Buttercream and Modelling Chocolate Roses by Dalya. If you are in Melbourne and would like to join The Melbourne Cake Club, you can - our Facebook page is here and our Meetup page is here. We meet on the second Thursday night of each month from 8pm to 9.30pm at various venues. I chose this week's Eating with Ellie theme of Perfect Pasta. Pasta is not one of my favourite foods, but I guess at the time of choosing the theme, I was trying to be alliterative. Don't get me wrong - pasta is OK - but it is not something I ate much of growing up, hence I would not miss it much if I never had it. 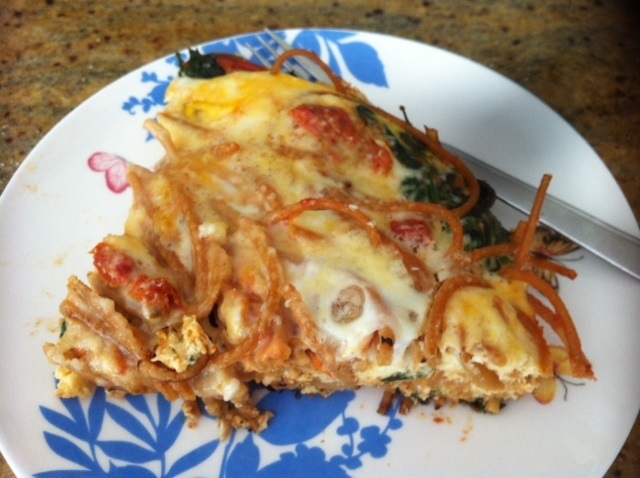 The recipe that I chose is Ellie's Spaghetti Frittata. Granted, this dish does not look very attractive - the spaghetti makes it look like something from a Halloween party - but it tastes really good. 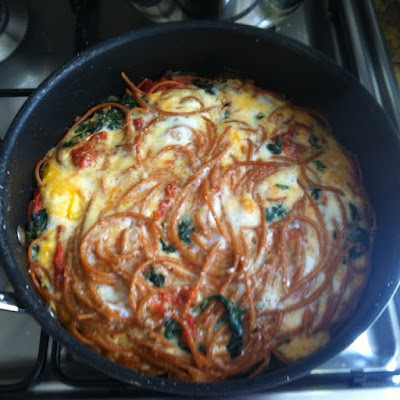 The frittata contains spaghetti, spinach, onion, sun-dried tomatoes and cheese. I'd probably replace the sun-dried tomatoes with fresh cherry tomatoes if I made this again, as I found the strong flavour of the sun-dried tomatoes a little out of place here. It's Tuesday with Dorie, and this month, for my first recipe, I chose the Caramel Tart. It's basically a caramel custard baked inside Dorie's sweet shortcrust pastry. When I re-read the recipe, I realised that the two separate layers resulted from leaving the foam on the filling of the tart. Despite my tart being somewhat of an ugly duckling, it tasted good. I liked it slightly warm, and it was even better when I did what I was told and allowed it to chill completely. 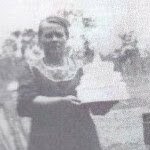 To see what the other Dorie bakers made this week and what they thought, visit the LYL section of the TWD website.